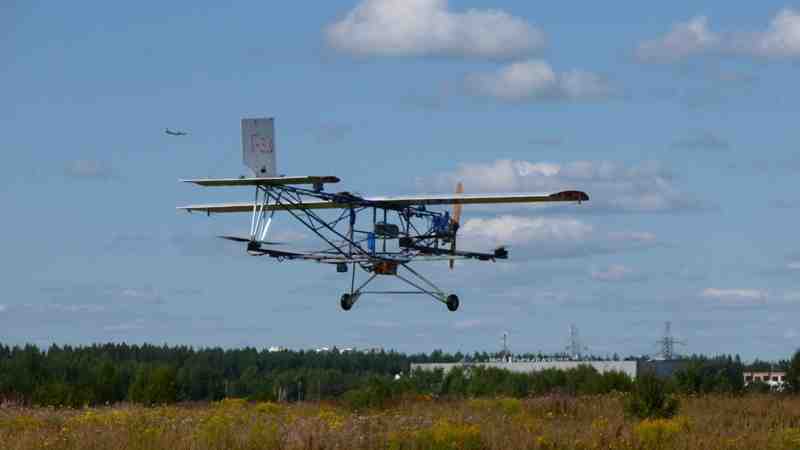 Moscow-based company Dronestroy has designed and tested several types of unmanned convertiplane, an aircraft that can change its rotor tilt for vertical takeoff. Currently, the company is developing a trial module that will allow testing 30 aircraft in flight in the Moscow Region. They will perform last-mile cargo deliveries to the locations that lack roads and airports, as well as other tasks. The project requires a total of RUR 150 mio ($2.3 mio). Dronestroy financial director Kirill Levchuk shared the project details with Invest Foresight. In the 1990s, future Dronestroy founders Igor Belov and Kirill Levchuk were involved in mobile network business in the Nizhny Novgorod Region and owned the company PCSR (Personal Communication Systems of Russia). The businessmen created the Rus hardware and software system, which allowed access to the internet including through Wi-Fi. Later, the scheme was implemented in Moscow’s district of Mitino by the Lealta company, with internet access available both in the connection point and also in the entrance hall and even in the street. Five years ago, business partners began developing an unmanned aircraft; it required wireless broadband – a stable high-speed wireless networking access that allows transferring monitoring signal, remote measurements and hi-quality images with a speed of 10 Mbps and whose signal is impossible to intercept. The current models of quadcopters running on batteries can perform flight only for 20-30 minutes and cannot be used for cargo deliveries. Dronestroy has managed to increase the flying time to 70 minutes: with a speed of 30 km per hour, the aircraft can fly 15 km to the destination point and back. “This is insufficient for delivering cargoes, and we decided to use a combustion engine”, Kirill Levchuk says. 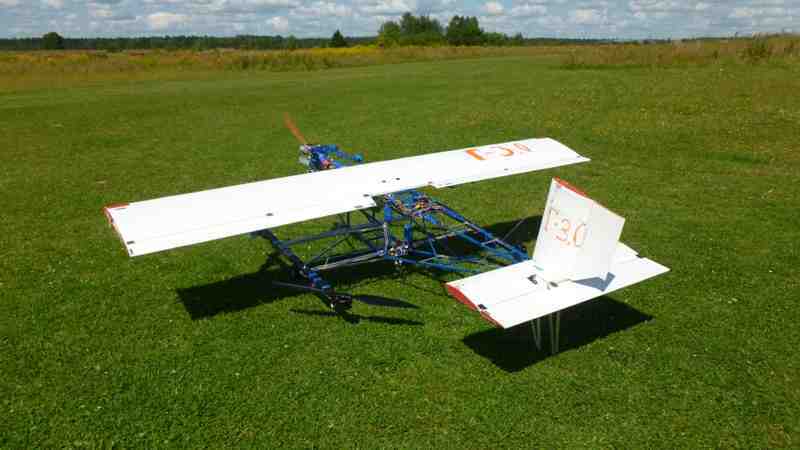 Dronestroy’s convertiplane whose serial production preparations are currently underway is a plane-type aircraft that uses four electric engines to take off similar to a quadrotor; at the height of 15-20 meters, the combustion engine starts, making the device fly similar to a regular aircraft. The electric engines were developed by Dronestroy; previously used Chinese-produced models burnt off due to low quality wire winding. As of today, two engines have been produced, each having a 110 kg thrust and costing RUR 1 mio ($15.5K). The company has developed and tested a total of seven unmanned aircraft, including those equipped with weapon mock-ups. Dronestroy’s own manufacturing facilities are located near the village of Mitino in the Moscow Region, with four CNC machine tools for producing propellers and parts. The company also built a cellular tower to control the aircraft. Despite lacking finished design documentation, all aircraft have performed flights at official permissions from Russia’s State Air Traffic Management Corporation. One of the Dronestroy models weighs 30 kg and can carry small cargoes of up to 10 kg. It can move at the speed of 130-150 km/h, like a crop duster plane. Existing Russian-made drones have not yet reach such speeds: the SKYF cargo drone can only reach a speed of 5-10 km/h. The new drone will be named St. Bernard-3, in honor of the famous dogs bred by monks for the rescue of lost travelers on the Great St. Bernard Pass. Legend has it that St. Bernard dogs carried small kegs on their collars that held brandy for the travelers to drink to keep warm. The wingspread of the drone is 3 meters, hence the number three in the name. The St. Bernard convertiplane can also save somebody’s life. This drone is designed, first of all, to deliver small cargoes to places that cars or small planes will not reach. The number of light aircraft airports in Russia has declined sharply. There are fewer of them in Russia then in Alaska. At the same time, light aircraft are the only transport at 60% of Russia’s territory, including Siberia, the Far East and the Far North. By 2023, Russia will lose most of its light aircraft. The convertiplane does not need an airport or a road, it can land practically anywhere. The national postal operator Russian Post needs convertiplanes that can deliver cargoes of up to 200 kg. The next drone developed by Dronestroy will have a wingspread of 10 meters and will be able to carry such weights. The Dronestroy company was registered in March 2017. Its sole owner is Igor Belov (according to Kontur.Focus contractor database). Investments in the drones reached some $5 mio, but not a single drone has been sold yet. All drones are ready for serial production. The company is now looking for RUR 50 mio ($773K) of investment to get an additional RUR 100 mio of state financing. The project is supported by the Aeronet National Technology Initiative. The company is also holding talks with the United Aircraft Corporation, Sberbank, Zhukovsky Research and Technical Center and other potential partners. “Only a few customers would purchase the drone, most of them need its services,” Kirill Levchuk says. The Dronestroy drone costs RUR 1.5 mio ($23K). One service hour will be cheap – cheaper than a car – because of the speed and the absence of the pilot. Expenses will include fuel, insurance and maintenance. Some governors, including the governors of the Moscow and Tver regions, are interested in logistics services. Dronestroy plans to create a logistics company which will offer cargo deliveries to individuals and businesses. In the first year, ten drones will be tested in the Moscow Region; trials will begin in the summer.